The best racing passes are the ones where someone just whooshes through their competition like a magical curvy lane through appeared for just them. You stare at the pass and can’t fathom how the driver made it work without hitting anything. 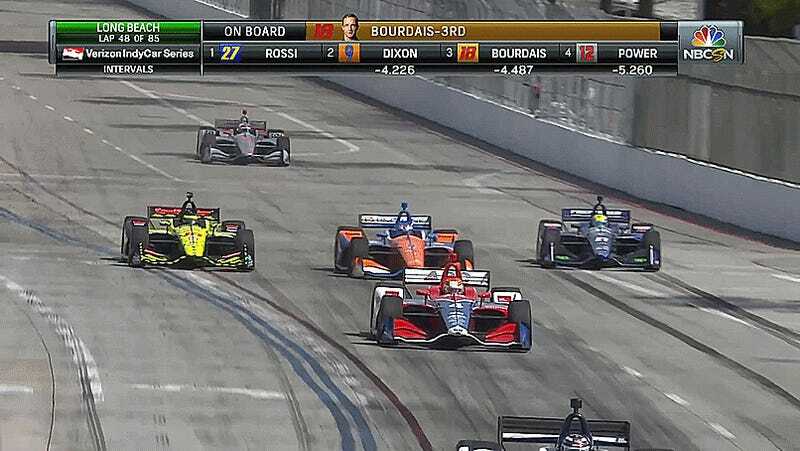 Let’s savor this insane IndyCar pass from the Long Beach Grand Prix in all its nutty glory. Bourdais used his push-to-pass to first pass two cars around the outside and then cut down the inside of a third car to speed through the pack. It’s all so smooth you can hardly believe he just cruised on through that narrow gap to second place without clipping or wadding up a car. Clearly, (Alexander) Rossi was on a different planet, but other than him we were right there. I got Dixon on the restart and Race Control deemed that a violation. I thought that was interesting because I am not quite sure what I was supposed to do. I was committed. There was room and he didn’t see me, so he came down on me and pushed me into the pit lane. If you get forced into the pit lane, I am not sure it is your responsibility. So, I got rather upset, so I passed him right back. I was pretty happy about that. Then we were just cruising. Unfortunately, as a group, we took a chance to stay out too long and then it went yellow. Race Control could have waited a couple seconds before closing the pits, but they didn’t and we went to the back where we had to race idiots. I was racing (Charlie) Kimball side-by-side and he gives me no room, and he bent both of my toe links on the right side. It was pretty much game over from there. I made a mistake because of it trying to pass him again later into Turn 9. The car wouldn’t turn anymore. Then, in the next corner, Jordan King felt like a hero and took us out. After that, I had to deal with another idiot, Matheus Leist, who tried to crash both of us a couple of times. There really wasn’t much to salvage after that. It’s really disappointing. The car was good. I drove the wheels off it. Passed a bunch of guys and we have nothing to show for it. Idiots! Never change, Seb. We need more post-race remarks from racing drivers who tell us what they really think. Californian driver and Long Beach Grand Prix pole sitter Alexander Rossi was untouchable for most of the race, nailing starts and restarts like a pro and rocketing out in front of the rest of the field. He ultimately won the Long Beach Grand Prix in front of friends and family who showed up for his home race.